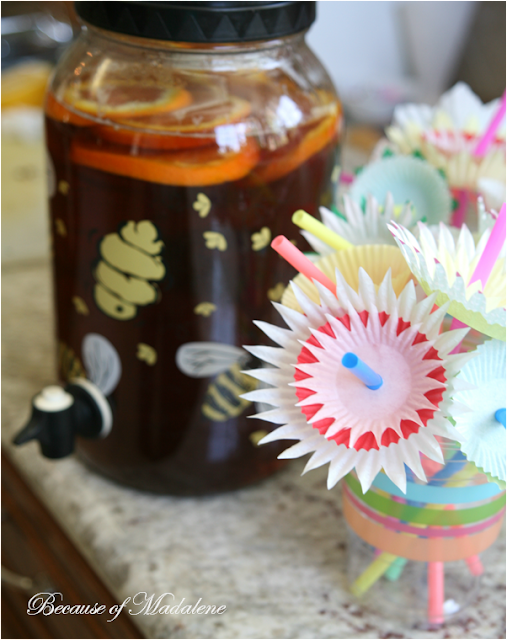 Aside from soda, wine, and Bellinis we served Homemade Sun Tea for my sister's surprise bday celebration. And to make it more festive... cute floral straws to go with it (a fun craft seen on Pinterest made of paper muffin cups). The tea is simple to make but allow at least 4 hours to let it sit in the sun so the water can really soak up all the good flavor from the tea bags. Once it's done steeping, throw in a few citrus slices to add some sweetness and freshness. In a gallon sun tea pitcher, fill the water up to almost the top. Leave enough room for the tea bags and citrus. Put in the tea bags. Close the lid and let sit in the direct sun for about 4 hours. Then, take out the tea bags, add the citrus, pour over a cup of ice and serve! Really easy and so tasty for a hot Spring or Summer day.